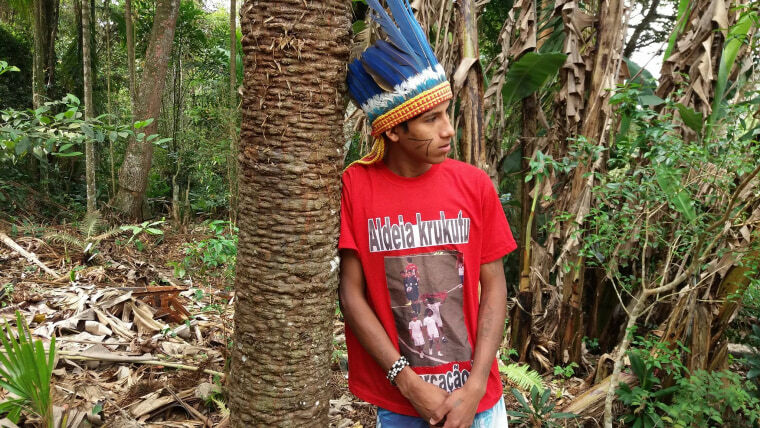 RIO DE JANIERO- The opening ceremony of Brazil’s World Cup in 2014 also marked the kickoff of a campaign by teenager Werá Jeguaka Mirim to fight for indigenous land rights through his rap songs. He had been selected, with three other children, to free a peace dove at the ceremony, but in an unsanctioned move, Werá also held up a red-and-black poster reading “Demarcation Now!”. The poster was hidden in his underwear, the suggestion of indigenous leaders from his Krukutu community of some 300 indigenous people in Brazil’s biggest city, Sao Paulo. “After this I started to see that the indigenous fight (for land demarcation) is very important. This act made me become a real activist,” the 16-year-old told the Thomson Reuters Foundation. Werá, who had already written indigenous tales and poetry, started to compose rap songs just a few months after the opening ceremony and rebranded himself as Kunumi MC, the first solo indigenous rapper in the country. “These songs are helping to raise awareness about land demarcation even among indigenous people,” Werá said. The demarcation of land for Brazil’s 900,000 aboriginal people is controversial. While the formal ownership of land by the country’s some 300 indigenous tribes has been shown to preserve cultures and the rainforests where many of them live, plans to allocate new lands for indigenous communities have been on hold for months. Indigenous leaders are concerned that political moves will put an end to their claims. Some powerful rural lawmakers have proposed changes to the land demarcation process, including the opening up of indigenous reserves to mining companies. According to data from advocacy group Catholic Indigenist Missionary Council (CIMI) in October, there are 33 proposals threatening indigenous rights before the National Congress. Of these, 17 are tied to land demarcation, including a proposal to allow the exploration of natural resources in indigenous land and a new framework for the land demarcation process, CIMI said. One of the most controversial proposals is to transfer to the National Congress from the federal government all decision-making responsibility tied to indigenous land demarcation. The proposal, known as PEC 215, became the name of one the songs of Sao Paulo-based indigenous rap group Rap Oz Guarani. “Our land doesn’t get us dirty/ what makes us dirty is your papers/ your laws, vanity and your cruel hatred/ children want to grow, young people want to live/ so why are you destroying our nature?” the song says. The group’s first song “Jaraguá village warrior” was related to a repossession order filed three years ago by a lawmaker against the rappers’ indigenous community. “Here in the community indigenous warriors cannot talk about their difficulties. The rap is something that has strengthened the indigenous fight a lot,” said the group’s founder, 18-year-old Jefersom Karai Xondaro. Brazil’s oldest indigenous rap group, Brô MCs, fights for similar causes in the city of Dourados, in Mato Grosso do Sul state in the country’s central-west region. Through rap songs, Peixoto and three other indigenous musicians, along with a non-indigenous woman on backing vocals, also challenge racial prejudice. All the indigenous rappers use Facebook and YouTube to promote their songs, concerts and events - hoping their protests will reach the ears of Brazilian lawmakers. In Brô MCs’ case, their music has made an impact beyond Brazil’s borders, with the song “Red Land” played at the Berlin film festival as the soundtrack of a Brazilian film. “Red land of spilled blood/ from the massacred warriors in the past/ farmers, mercenaries, landowners/ several died defending their land/ in the village where I live there has been a war already,” the lyrics read. The rap groups sing in two languages: their native Guarani and Portuguese in order to reach a broader audience as possible. Werá says land demarcation is a priority for the future of Brazil’s indigenous people. He also wants to bring “schools to indigenous communities; health posts too because many indigenous died in the past because of diseases.” he said. Preserving the indigenous way of life equates to preserving the forests in which they live, which brings benefits to all.